I Buy Way Too Many Records Dot Com: Badge 714 - Tearless 7"
This 7" is another one of that I picked up while in Japan last year. Yes, here we are a year and a half later and I still have a pretty large pile of records from that trip that I haven't written about yet. Honestly, there are still so many that by the time I get through them I actually might be able to afford to go back to Japan again. 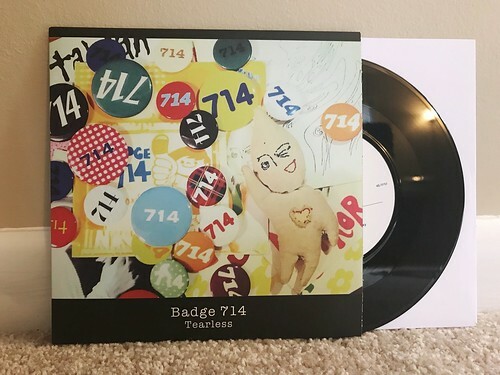 I wasn't familiar with Badge 714, but from what I can tell, they were a band that was active in the mid 90s and this version on Killi Killi Villa is a reissue of a long out of print 7" that came out way back when. It's funny that when listening to it, while it still has a 90s vibe to it, if you didn't tell me it was almost twenty five years old, I don't think I would have realized that. The band has a female vocalist, Wakako Uemura, who has such an incredible grasp of melody and a really powerful voice. In some ways I'm reminded a bit of Cigaretteman, but only just a bit as Badge 714 is much more melodic and the songs tend to be more relaxed. The two songs on the record itself are accompanied by two extra songs on the download. I'm not sure why they weren't on the record itself but if Discogs is to be believed they both originally appeared on compilation albums. They are both excellent and I do wish they were on the actual record. Luckily my favorite of the bunch, "Mama Made a Face at the Cloudy Sky," is on the 7" and it's really a hell of a song. I don't think there's much else out there by Badge 714, but if anyone else knows something about other records they have out, let me know so I can start looking around for them.